The army/utility jacket trend isn't a new one. I remember back in the 90's when I was in high school, lots of people wore actual army jackets. 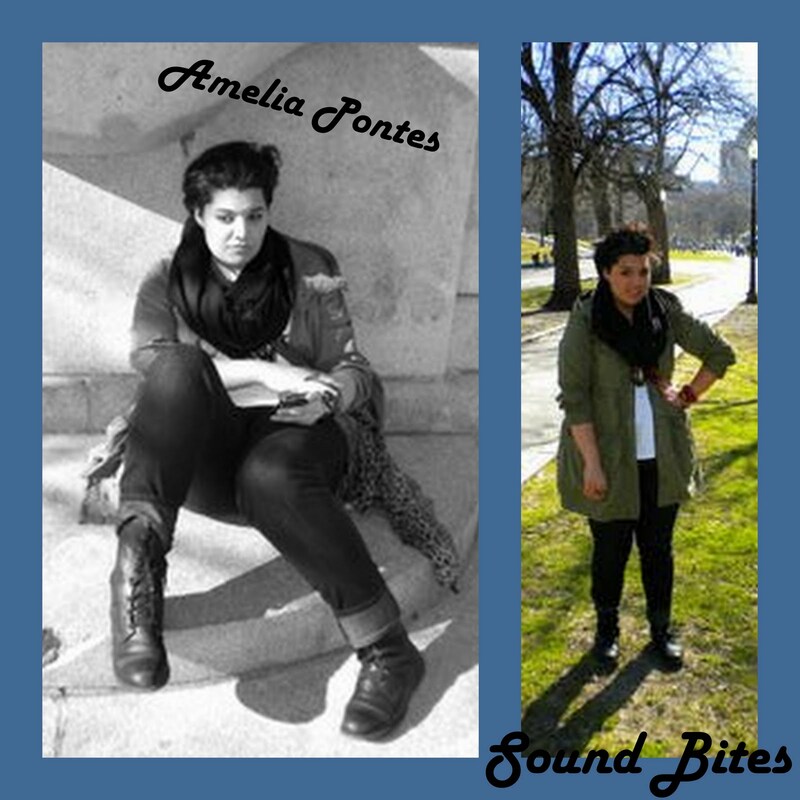 You remember the 90's grunge look, flannels, doc martens & army jackets were the staples of this fashion trend. I never had an army jacket, the only place to get them back then was either an army surplus store, or if you got lucky finding one at a thrift store. Today the army style jacket has made a come back. The runways were very military inspired with these types of jackets. Today's modern twist is wearing your jacket with dresses, skirts and more feminine looks. You can also rock it out with your jeans/skinnies or shorts and look great. A few of my blog friends have totally made this trend work. After seeing these curvy cuties in their army/utility style jackets I just had to have my own. Check out my look here. So how do you feel about this army jacket trend. Is it stylish with dresses & skirts? Better with jeans or more casual looks? Take a look at the outfits below, maybe my friends will help you decide. 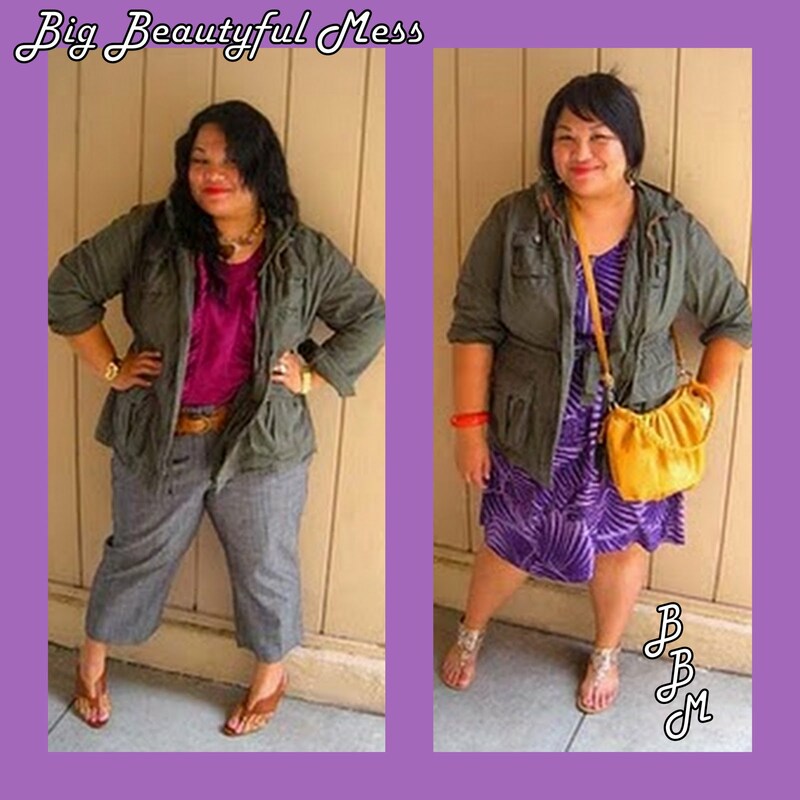 BBM from Big Beautyful Mess is wearing a Old Navy jacket. She totally made it work for Lucky magazine challenge. She was my style inspiration! Amelia from Sound Bites is wearing a Gap jacket. Paired with skinny jeans and combat boots made the perfect mix for day walking around the city. 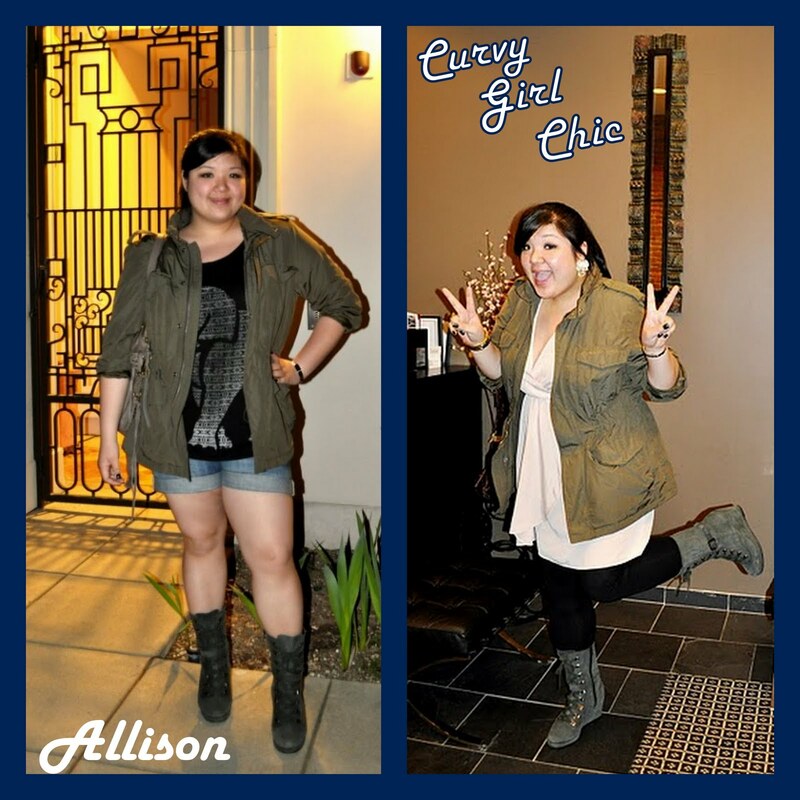 Allison from Curvy Girl Chic is wear a Gap Jacket. She is remix queen, she makes all the trends work. 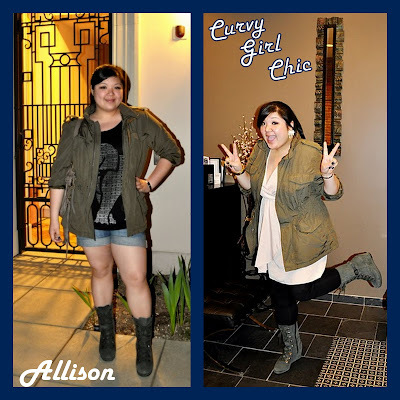 Check how she rock her army jacket for a casual look & a more feminie look with a cute dress. Thanks to the ladies for allowing me to feature them in my Trends & Friends post. Sorry it was a bit late this week. I am still adjusting to my work hours, and making time for my passion; My Blog! If you enjoy my weekly post and want to be a part of it, don't be shy. Email me your pictures so I can feature you wearing the trends. It will be easier to continue this feature with your help! Don't forget you still have time to enter my giveaway, until Friday at midnight. Great post! I love all those looks! love all those ladies.. and i love the utility jacket trend! Love those looks! I really want the first Gap jacket! I like this look but I've yet to find a good military jacket style that'd suffice. :( Maybe the thrift store, lol. I love your blog and your style!! I love this trend, need to find myself a good utility jacket! thank you CID !!! i appreciate the feature and love how u and the other girls rocked their utility jackets .... i so want one in khaki now! Hi everyone! I'm from London but am living in Berlin at the moment. I really like these pictures and your style of presentation is lovely..
Dooney & Bourke Giveaway Winner! Weekend Review: Another Year of Style!